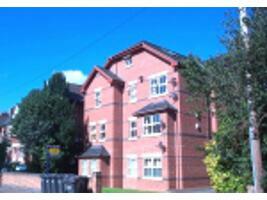 Three/Four double bedroom duplex apartment (2nd/3rd floor) in modern purpose built block. Excellent West Didsbury location just off Lapwing Lane. The property comprises of lounge, fitted kitchen with cooker, fridge/freezer and washing machine. Bathroom with bath and shower and three/four bedrooms. Also benefits from parking, electric heating and alarm. Furnished. Council tax band B. EPC rating D. Deposit £1,095. Agency fee £149 incl. vat. Available 1st April 19.